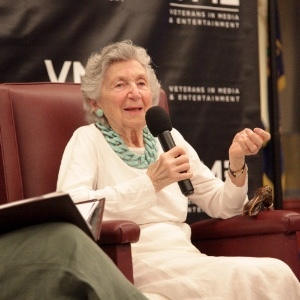 Marcia Nasatir is 91 and graciously shared a few stories at the VME Women's Event last Sunday. She talked about her experience becoming the first Woman ever to have the title Vice-President of Production for United Artists. Marcia talked about her life as a single mom in NYC, to working on films at United Artists such as Rocky, Carrie, Apocalypse Now, and One Flew Over the Cuckoo’s Nest. She was also at Johnny Carson's production company, and produced Hamburger Hill and The Big Chill which garnered three Oscar nominations for Best Picture, Best Supporting Actress (Glenn Close) and Best Screenplay. Special thanks to American Legion Post 43 for providing the meeting space. And special thanks to VME member Lisa Costanza, Dianna Wilson, and Keith Walker for leading the volunteer group, and Maggie Dewan-Smith for hosting. 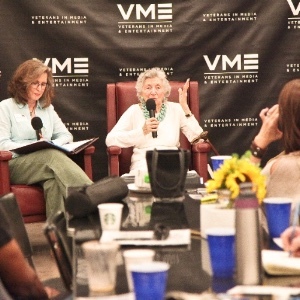 The VME Women's Group is supported by a grant from the Hollywood Foreign Press Association.